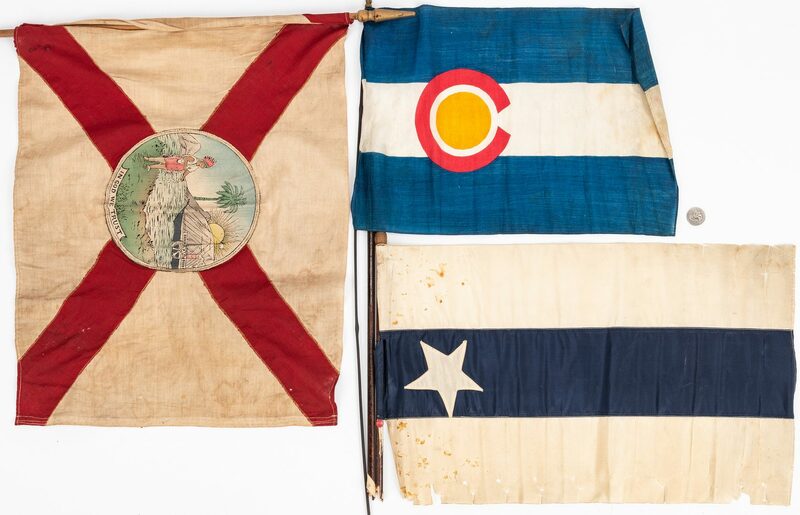 Three (3) flags including Florida, Colorado, and Bonnie Blue. 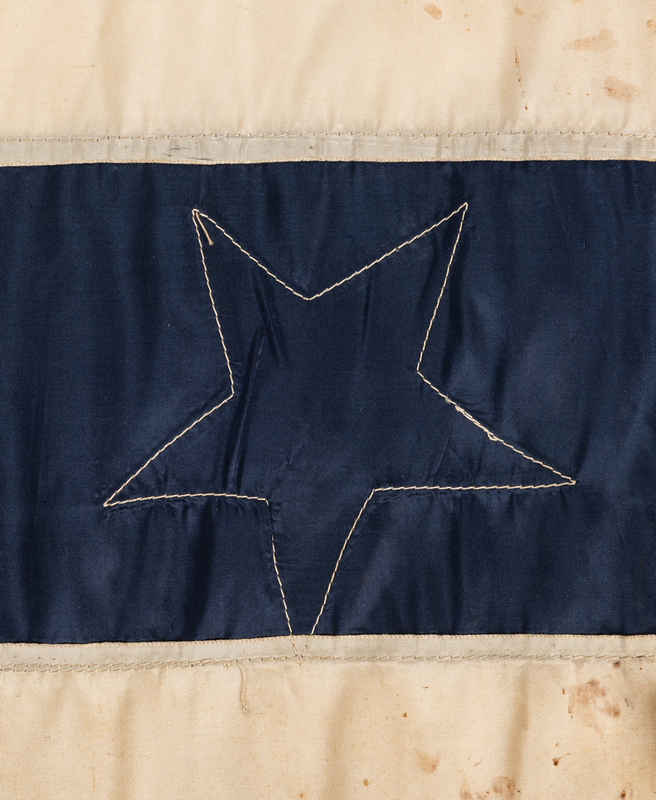 1st item: Modified Bonnie Blue reunion flag, machine sewn silk, consisting of a single white star on a blue stripe with a white strip above and below. 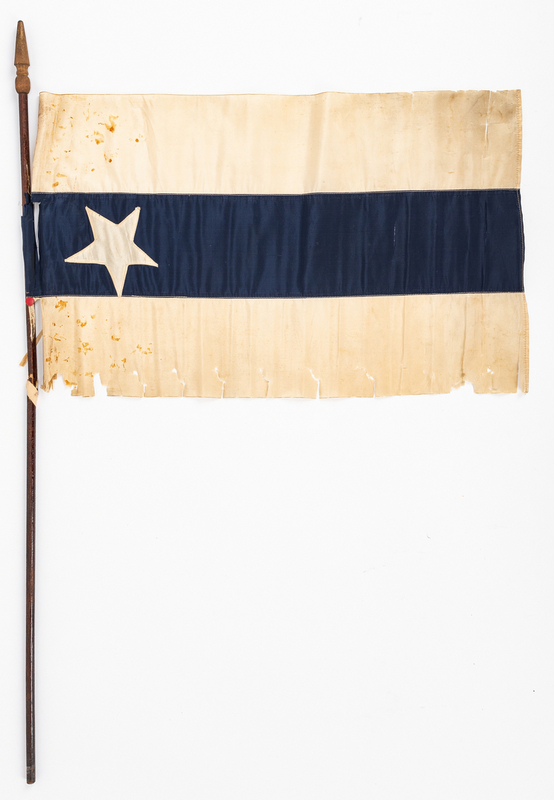 Majority of left side of flag sewn to a wooden stick with a pointed end. 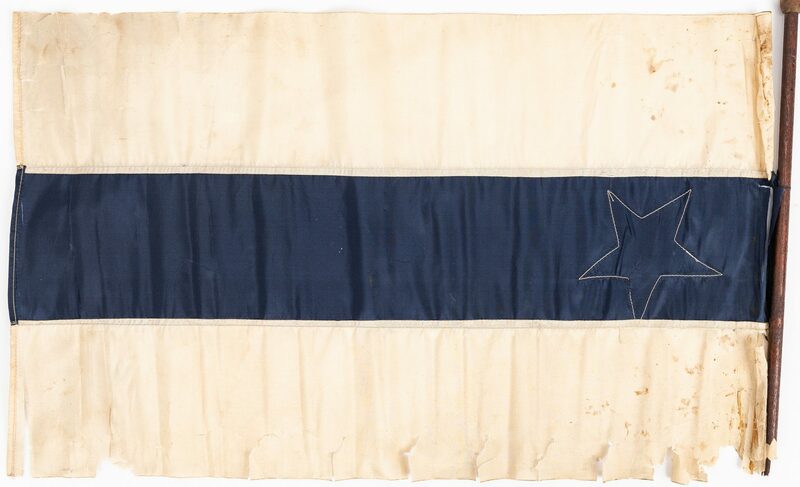 Flag – 13 1/8" H x 21 1/2" W. Stick approximately 31 1/2" L. Early 20th century. 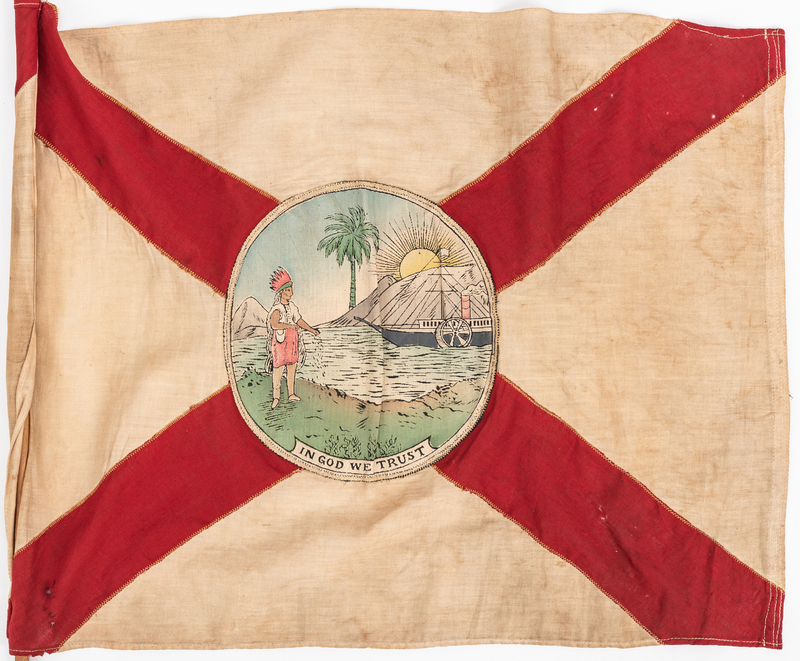 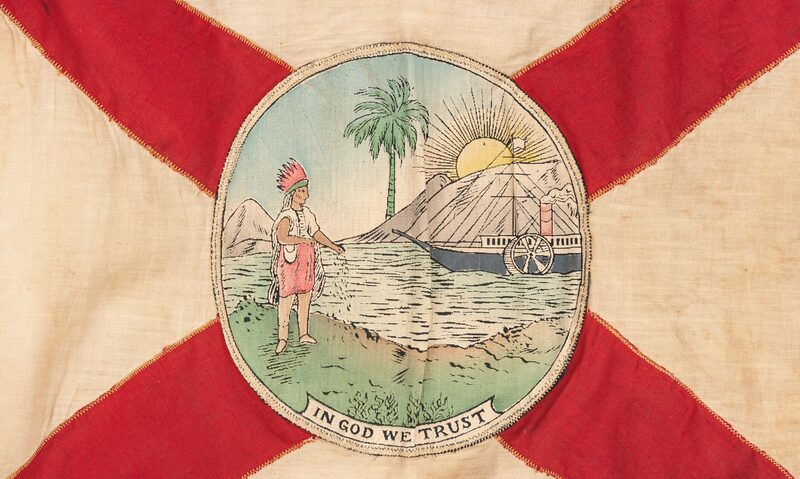 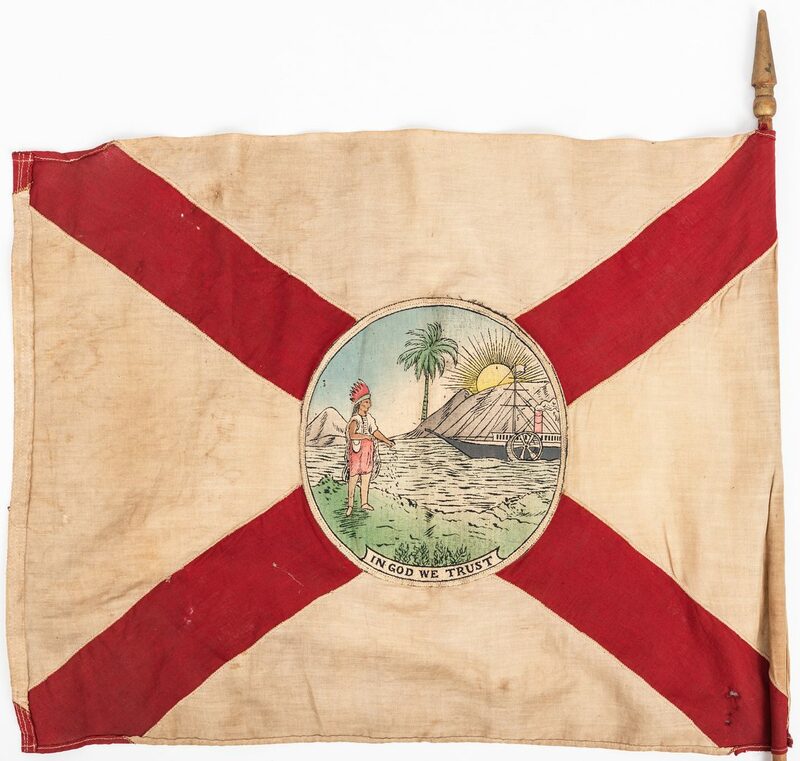 2nd item: Modified Historical Florida state flag, double-sided machine sewn printed cotton, consisting of the seal in use on the state flag from September 1868-November 1900 depicting a male Native American on shore beside a body of water, gazing at an approaching steamboat with the sun rising behind a mountain and a palm tree, reading "In God We Trust", on top of the red crossed lines in use from November 1900 to the present day. 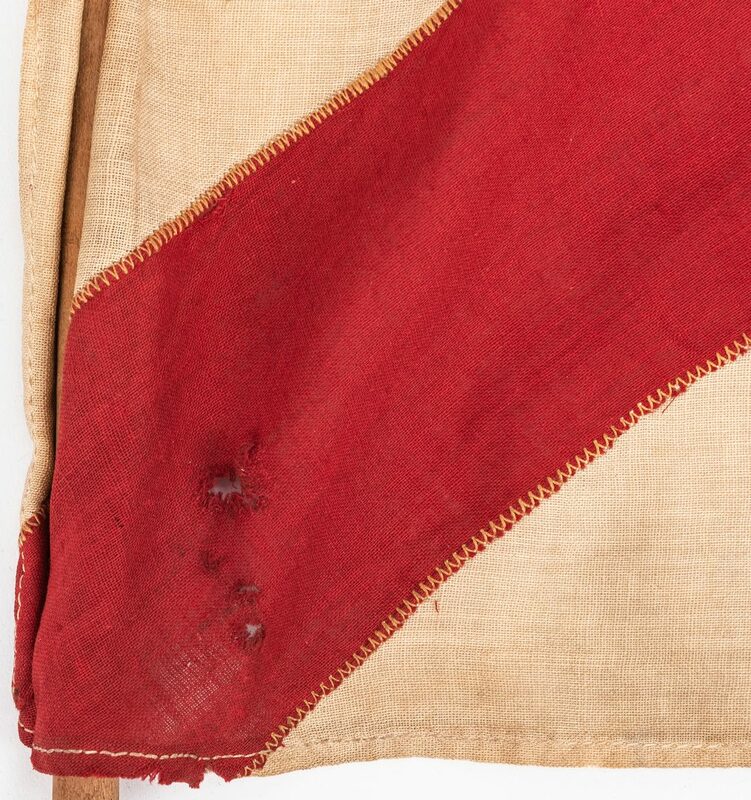 Left edge sewn to a wooden stick with gilt pointed top. 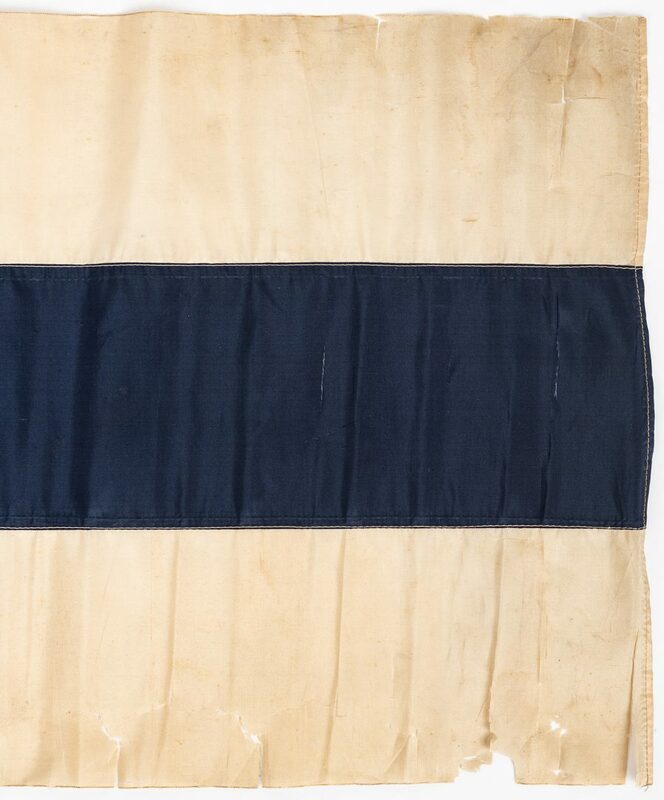 Flag – 16 1/4" H x 20 1/2" W. Stick – 38 5/8" L. 20th century. 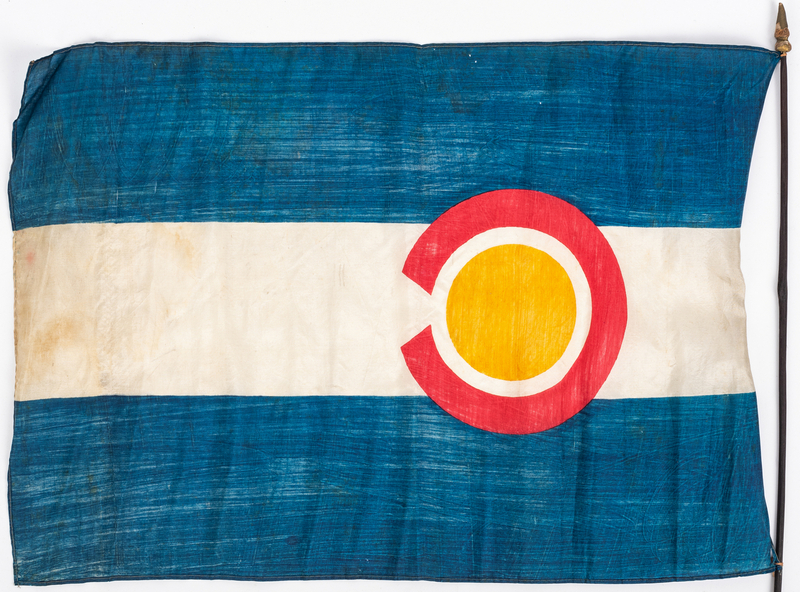 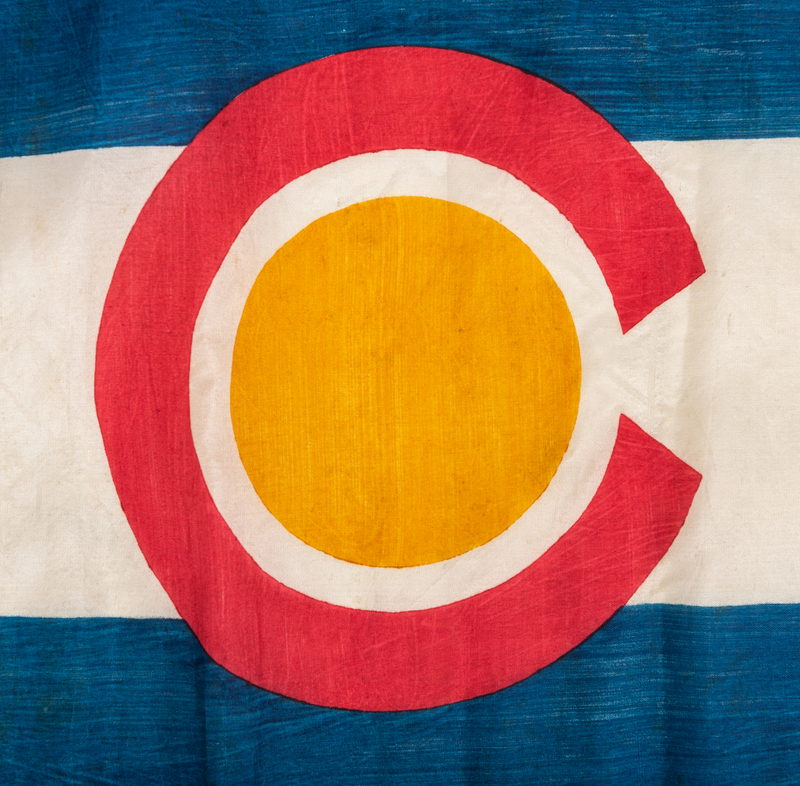 3rd item: Colorado state flag, double-sided machine sewn printed silk, consisting of three horizontal stripes of blue and white with a circular red "C", filled with a golden disk. 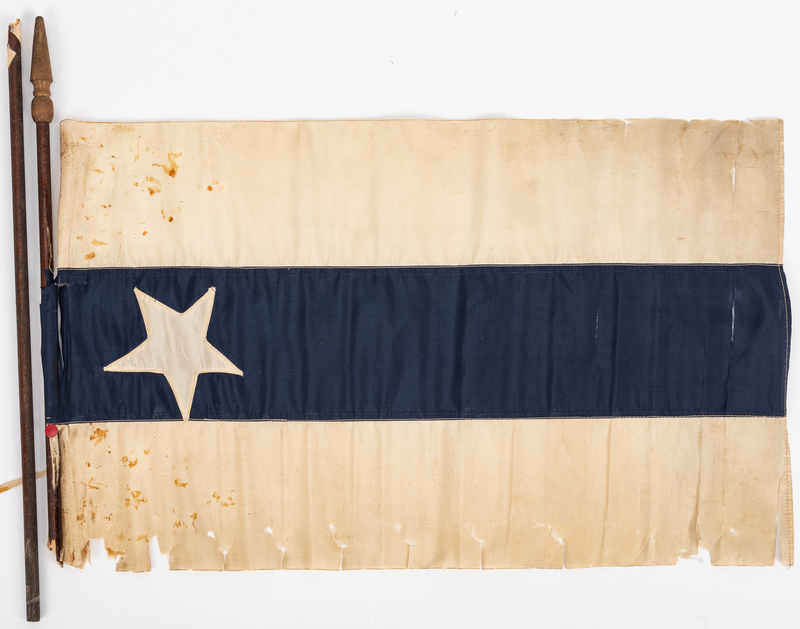 Top and bottom left edges sewn to a black wooden stick with gilt point. 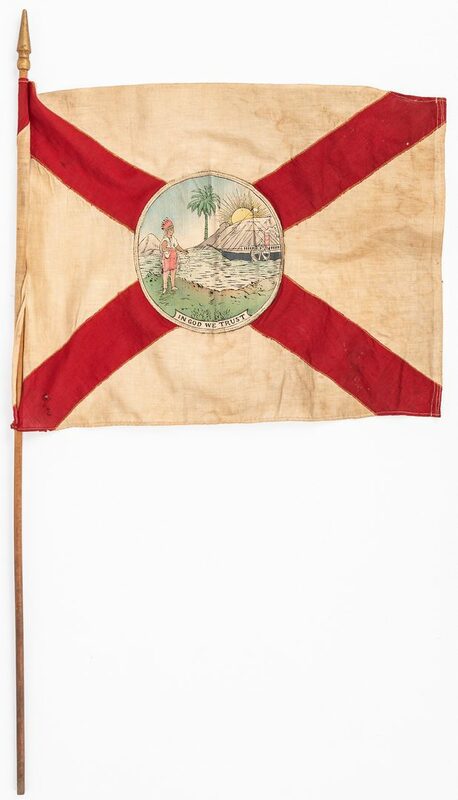 Flag – 11 1/2" x 16 1/2" W. Stick – 27" L. 1st half of 20th century. CONDITION: 1st item: Tears, areas of loss, largest 4 1/4" x 3/4", stains, to surface of flag. 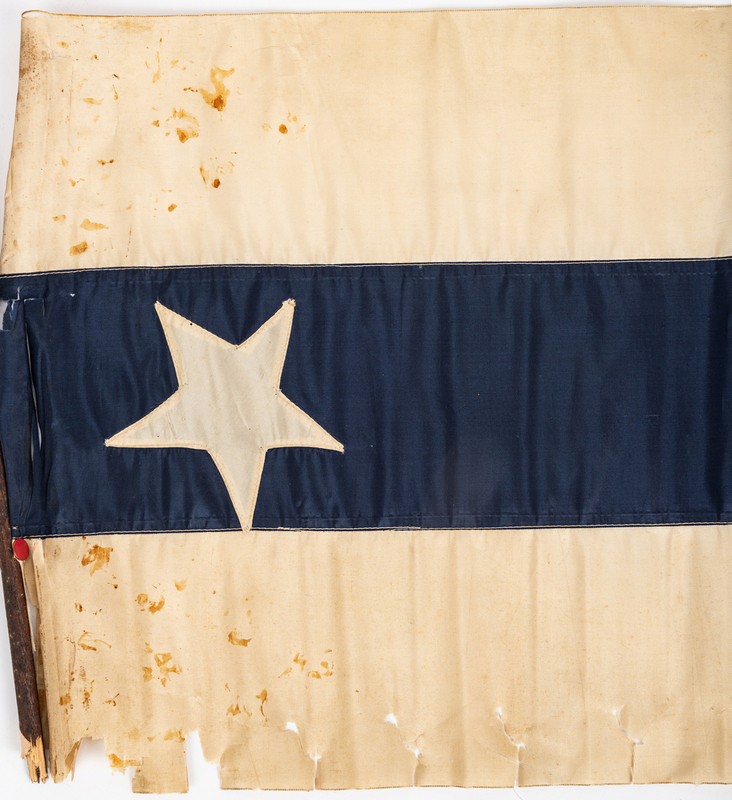 Left side of flag attached to stick by a red thumbtack, above lower white stripe. Stick is broken approximately in half. 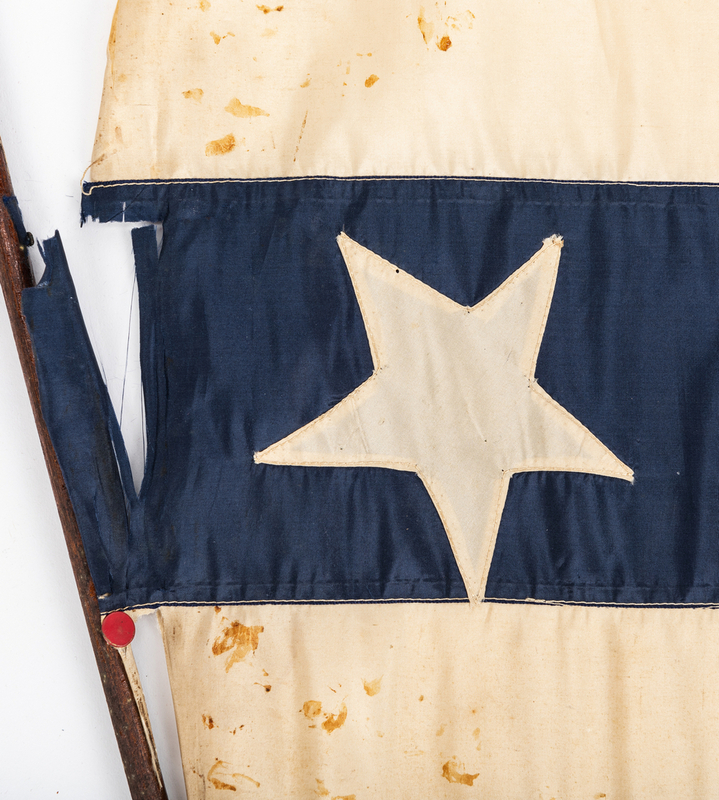 2nd item: Stains, tears, holes, largest 1/2", surface of flag. 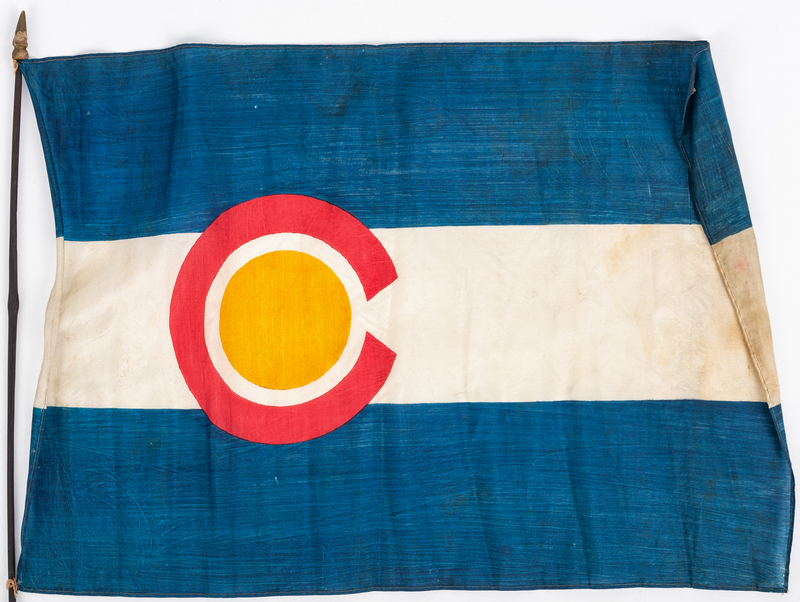 3rd item: Stains, tears, holes, largest 1", surface of flag.